ST. LOUIS — A standing room only crowd of trade unionists and community leaders attended the Fourth Annual Missouri/Kansas Friends of the People’s Weekly World “Working Class Media and Democracy” forum, held here Oct. 27. 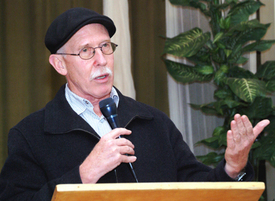 David Bacon, an Oakland-based photojournalist and author of “The Children of NAFTA” and “Communities Without Borders,” keynoted the event. Members of the Coalition of Black Trade Unionists, AFSCME, Unite Here, UAW, and the American Friends Service Committee attended the event. State Rep. Jeanette Mott Oxford (D-Saint Louis) facilitated the discussion. Over $3,000 was raised for the People’s Weekly World.